If you played enough hidden object puzzle adventure genre games, you should have learned the dynamics of how it works in this realm. One of those things is that learning something surprisingly new about your family or distant relatives isn't always a good thing. Witches’ Legacy: The Charleston Curse is an example of this principle. The story is presented with very beautiful and impressive graphics. You play as the only living relative of an orphan girl. This girl named Lynn has a terrible story to tell about her family that isn't alive any more. And the story is that all of them were systematically killed by a witch leaving you the only one who can help Lynn excape the same destiny. The story is presented with very beautiful and impressive graphics. All the animated details together with excellent audio make it a very enjoyable experience to follow the events of the story. The games offers you to play the same kinds of levels as many games of this genre. 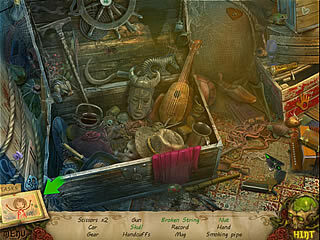 The hidden object levels are a bit cluttered, but most of the stuff belongs to the scene. Several of the items on the list are interactive. The hint system is available but it takes a while for it to recharge. The puzzles are quite challenging and you might need help to solve them, even thought they are not so new or unique to this game only. The interactive adventure part may not be as obvious too. All in all the game is friendly and smooth enough without extreme gloom-and-doom. This is Witches' Legacy: The Charleston Curse review. Download this game here.